Our lives are filled with Greco-Roman symbols and memes which have lasted for thousands of years: Cupids, cornucopias, the bowl of Hygeia, the staff of Asclepius, Justice with her scales, the gorgonian, Mercury’s feet, the centurion’s helmet, the Aegis, the victor’s wreath, the quincunx, Athena’s owl, the lyre, the comic/tragic masks–they all have immediate meanings for us. Thus it comes as a surprise to look at actual classical art and see how many ancient Mediterranean motifs have not survived at all, but have become baffling to everyone except for classical scholars. 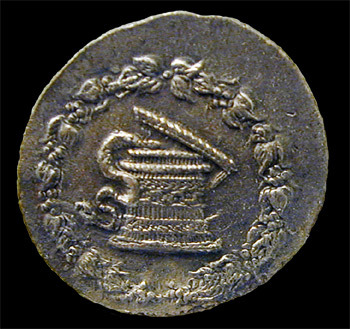 We now scratch our heads when we realize how many ancient coins and sculptures bear the modius (a grain basket symbolic of the underworld), the lituus (a ritual wand which betokened augury), or the cista mystica—which is the subject of today’s post. A cista was a little basket/casket which was used to store toiletries, jewels, or other small personal effects. A cista mystica (literally “secret casket”) was a sacred object of the mystery cults which (seems to have) contained a living serpent. The cista mystica was known to be sacred to Bacchus, but similar cult objects were probably also affiliated with Isis (and the perhaps with the Ophites, a Gnostic worship sect). In the Bacchic mysteries the serpent was carried on a bed of grape leaves and was a stand in for the god. 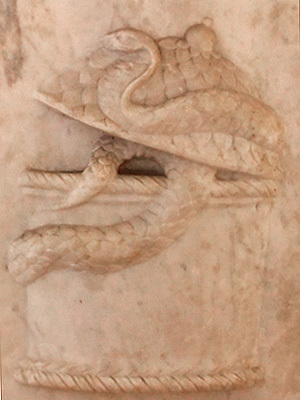 The characteristic form of the serpent was an important component of the symbolism and classical sources note it shares its shape with “the forms of men” (which is to say that it directly betokened virility and male fertility). The Roman mind sometimes was surprisingly literal and several preeminent men were rumored to have been fathered by gods in serpent form. Olympias mother of Alexander the Great was allegedly found sleeping next to a snake before giving birth to Alexander and Phillip of Macedon was said to shun her bed afterwards (Renaissance artists enjoyed painting this episode, but I’ll leave it to you to google the paintings and drawings). It should also be noted that the marriage of Phillip and Olympias was infamously volatile thanks to Phillip’s propensity to take other wives (and everything else). 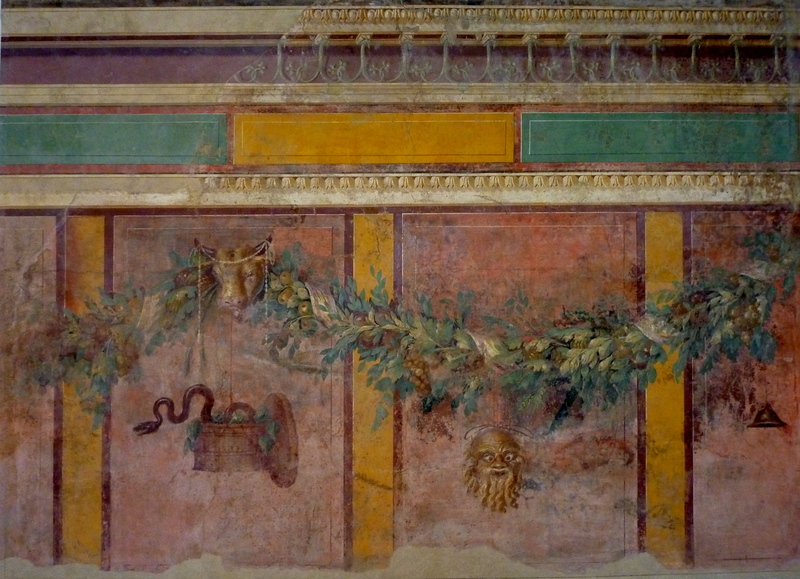 Augustus, the first Roman emperor, was also allegedly the son of a snake and it was said that his mother always bore the mark of the serpent’s embrace after his birth. Any Roman seeing the cista mystica on the coin of the realm would understand the message–not only were serpents fertility symbols which betokened otherworldly wisdom, but they were also proxies of divine mystery and Roman ascendance. I love your blog. Of those I follow, it’s one of three that I never miss. One thing. You might want to think about resetting your notifications so that they don’t show the entire post. There’s really no reason for anyone to come to your site the way it’s set, and they can just forward the things to their friends. Thank you for your endorsement! It means the world to me. I was wondering why I never get any bounce after publishing a post. I’ll have to go over the settings and see if I can figure something else out. Cheers!